What makes a smile beautiful? That's a complex question, but some qualities of a lovely smile are immediately identifiable: good tooth color, shape and alignment are a few of the most important ones. If your teeth could use improvement in any of these categories, porcelain veneers from Bolingbrook, IL dental practice Hidden Lakes Dental Care, PC could be just what you're looking for! 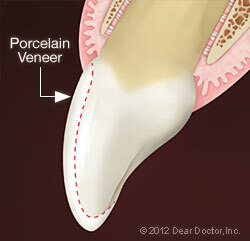 You may already know that a veneer is a thin covering over another surface. In dentistry, a veneer is a wafer-thin layer of super-strong porcelain that convincingly substitutes for natural tooth enamel. 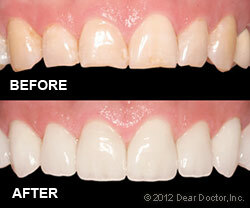 When bonded to your teeth, veneers can create a natural-looking, beautiful new surface. This new tooth surface occurs because dental porcelain, like natural tooth enamel, is translucent and tough. A wonderful advantage to using dental porcelain is that it doesn't stain like tooth enamel does. Just like the teeth nature gave you, teeth restored with veneers need gentle brushing and flossing every day. This will remove dental plaque and ensure good gum tissue health around the veneers. Regular checkups at Hidden Lakes Dental Care, PC in Bolingbrook will remain as important as always to your oral and general health. And keep in mind that as tough as veneers are, they may not be able to withstand forces that come from using your teeth as tools (to open packages, for example) or biting into very hard foods like candy apples — which isn't good for your natural teeth, either! And if you grind or clench your teeth at night, you might be advised to get a custom-made nightguard to protect your veneers — and your investment.